In the midst of another blockbuster year, Vans raised the bar on itself last September, pledging to grow revenue another 67 percent in the next five years with the goal of hitting the $5 billion mark in annual sales. That may seem audacious, but at the rate the skateboarder-inspired, Southern California lifestyle brand has been growing of late, that’s almost a guarantee. Vans is the fastest growing brand in VF Corporation’s portfolio, posting a 27 percent year-over-year growth rate in the third quarter. 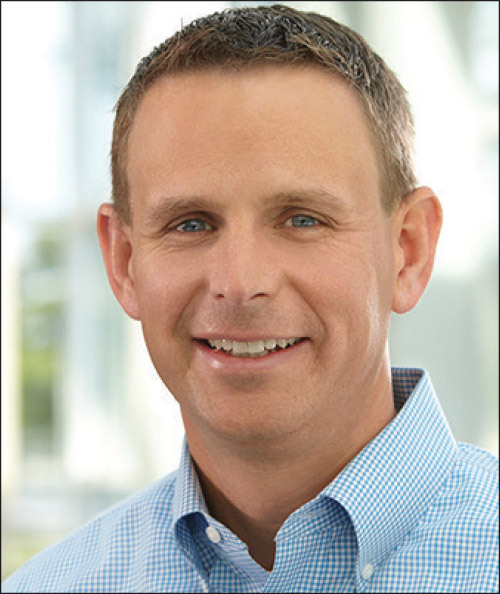 “If you go back 15 years and look at our growth curve from $300 million then to our path we’ve laid out to get to $5 billion in 2023, you’ll see very consistent growth in our business,” says Doug Palladini, Vans global brand president. The growth comes from Vans’ envious position of being simultaneously hip and nostalgic. Generation Z cites Vans as its favorite footwear brand after a down-trending Nike in Piper Jaffray’s annual teenager survey, while Baby Boomers and Gen Xers return to the models they’ve been buying since the Van Doren brothers first started making vulcanized slip-ons in Anaheim, CA, in 1966. In fact, heritage models made up 65 percent of the brand’s sales in 2018. “Vans appeals to the booming Millennial and Gen Z consumer,” agrees Jim Weinberg, chief marketing officer for DSW. “They have the right balance of social media exposure to keep the brand relevant to the younger consumers without alienating Gen X.” Weinberg cites the Ward lo-cut classic as a top seller for DSW in 2018. Now in its 53rd year, Vans has a deep archive to draw from. The best performing model by NPD data is the Ward, sold at the mid-market level. But Vans isn’t dependent on any one style. 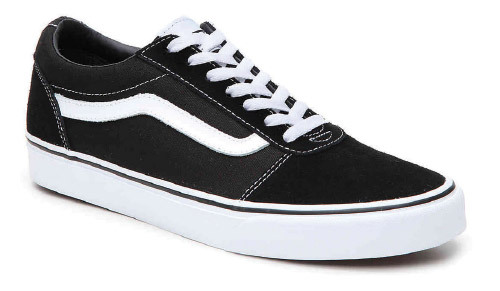 The Era, Old Skool, Slip-On, Authentic and Sk8-Hi are bigger sellers in 2018, Palladini cites. Of course, there’s also the Checkerboard, available in an array of colors, that’s forever cool since Jeff Spicoli, a.k.a. Sean Penn, sported a pair in the cult teen classic, Fast Times at Ridgemont High. By many accounts Vans’ hold on the retro shopper is only getting stronger. Credit Suisse stock analyst Michael Binetti wrote in a January note that Vans seems to be grabbing retro market share from Adidas, which capitalized on the trend with its Stan Smith and Superstar revivals. Retro doesn’t mean nostalgia, at least not completely. No brand can grow just on the fumes of past races won. Palladini says Vans’ success is its focus on the brand inspirations that established it: art, music, action sports and street culture. Keeping the aesthetic and design focused on those factors gives the brand a broad appeal worldwide, he believes. “If you flew from Beijing to Berlin to Boston, you would see a very consistent look in the way we show up to the consumer in the product line, the way our stores look and what we stand for,” he says. The balancing act allows for nuance within that for hitting on unique cultures, supporting local musicians, influencers and athletes to connect the brand with consumers. 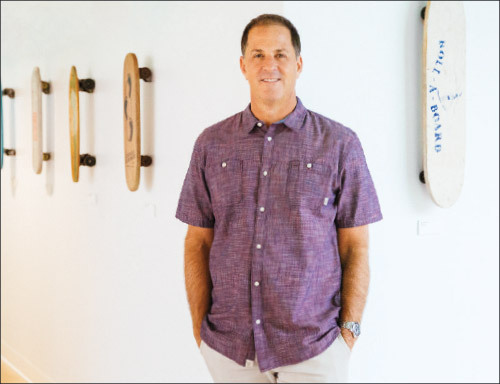 “A lot of our business is done in the lifestyle/fashion world, but we see keeping our roots well-watered by keeping that performance-based product around action sports strong,” Palladini adds. Connecting with consumers in this day and age means navigating the fragmenting retail world. “They’ve done an excellent job of straddling both the up-market and the mid-market, and having products that are meaningful for both without one channel hurting the other,” says NPD’s Powell. Palladini says the brand has had success by limiting distribution and “going narrow and deep” with select partners. That has both kept Vans from oversaturating the market and overemphasizing any one style as well keeping it relatively insulated from high-profile retailer bankruptcies of 2018. Nevertheless, wholesale represents the largest portion of Vans’ distribution channels in 2018 at 48 percent of sales. DTC, accounting for 9 percent last year, grew 50 percent in 2018 and is projected to command almost a quarter of business in 2023. Still, the overall pie is growing for all channels, with Vans predicting all will see healthy growth in coming years. While it may be hard to pinpoint what, if anything, Vans didn’t do well in 2018, there are actually a couple areas for improvement, mainly lack of a large presence (yet) in some major markets. That provides Vans with a surprisingly broad path for expanding sales to that $5 billion goal. In China, for instance, Vans two main competitors (Nike and Adidas) have 13 and 11 times the sales volume, while in the Americas, the U.S. has almost six times as many stores as the rest of the Western Hemisphere. Those figures mean that, in Asia and the Americas, there’s lots of room for Vans to grow. More immediately, Vans will press ahead on revitalizing iconic styles like the Era, a lo-cut canvas silhouette with a signature waffle outsole first introduced in 1976. The ComfyCush Era—featuring twice the proprietary foam than the original—debuted in February. “You’ll see it everywhere,” Palladini says. Overall, Vans is focusing on upgrading comfort aspects, featuring lightweight constructions with superior traction. Palladini believes the modern makeovers will benefit Vans across the board. “Consumers will consider us for anything we make once they love us,” he says. Altra, a performance running brand now a part of the VF Corp. portfolio, is poised for rapid growth. Whoever says change is painful needs to look at VF Corporation’s 2018 and reconsider their stance. In the first full year of Steve Rendle holding both the chairman and CEO titles, the conglomerate decided to hone its focus down to active and outdoor lifestyle, spin-off its denim businesses into a separate entity (Kontoor) and move headquarters from North Carolina to Denver. During the busy-busy year, the company managed to post revenue and earnings results that wowed investors and establish Vans as the hottest brand in the shoe business, posting a jaw-dropping 27-percent growth in the company’s third quarter report (ending Dec. 29, 2018) with stated projections to hit $5 billion in annual sales by 2023. VF has also expanded the portfolio last year to further growth. In June, the company snapped up Altra from Icon Health & Fitness for $131.7 million. Founded in 2011, the running brand generated about $50 million in sales last year—a level that’s expected to get a big boost now under the VF umbrella. “We’ll leverage our infrastructure and scale to bring the brand to a much wider audience,” Murray says. “The growth we’ve already seen from Altra confirms for us that this brand, with its highly differentiated and unique approach to anatomical design, has the potential to be a disruptive and meaningful player in the running and trail market.” Murray cites Altra’s Turin IQ smart shoe as making a name for the brand in the competitive running space since debuting in 2017. The shoes are outfitted with razor-thin IQ sensors in the insole that capture distance, pace and cadence, as well as key information about the wearer’s running style, like landing zone and impact rate. They also track how far and how fast one runs, as well as come equipped with a voice coach that gives pointers on how to run better while at mid-stride. 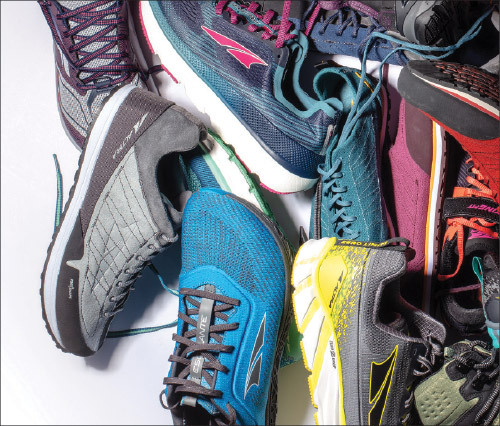 Murray reports a growing legion of everyday runners and endurance athletes who are becoming hooked on Altra’s unique design attributes. “The brand has an amazingly loyal following,” he says. For VF, it’s all about delivering on authenticity and quality that consumers demand. That active lifestyle mantra goes beyond excellence in products. Brands that are socially and environmentally conscious are equally important factors in the purchase decision, as well as for attracting employee talent. It requires paying more than just lip service to matters like sustainability. The new headquarters is a LEED Gold-certified building located downtown that, when fully renovated in 2020, should eventually house some 800 employees. The move to Denver is also expected to attract employees for whom quality of outdoor life is a major factor. Matters of sustainability are nothing new to Timberland, a cornerstone brand for VF. The brand has been at the forefront of eco-friendly manufacturing practices and products for decades. For example, ReBotl fabric, made up of as much as 50 percent recycled PET, is increasingly found throughout its footwear collection. The material can be applied to other VF brands. In addition, Timberland’s community outreach efforts—spearheaded by its annual company-wide Serv-a-palooza charitable initiative—is considered a blue print on how to give back to local communities and make a meaningful difference. VF as a whole benefits from the example Timberland sets forth. In fact, the company was recognized last year for its efforts when Rendle was recognized by Corporate Responsibility (CR) magazine as a Responsible CEO of the Year. The annual awards are given to corporate leaders who are committed to a progressive environmental, social and governance agenda. “We are committed to operating our business in ways that contribute to the betterment of people and our planet, and to setting a high standard for inclusive and thoughtful leadership that inspires others to follow,” Rendle stated. In 2018, VF was also named one of CR’s 100 Best Corporate Citizens, Ethisphere Institute’s World’s Most Ethical Companies and Forbes and Just Capital’s America’s Most Just Companies. Committing to sustainable business practices and engaging in community goodwill efforts are keys to success in this selling environment, according to Murray. Consumers have the ability to shop anywhere, anytime, from just about anyone and likely find similar pricing. The difference maker is brands that consumers feel good about buying, wherever they come across them. In VF’s case, that approach is working as Murray reports sales by channel, region and segment all grew strongly in 2018. And while digital may have changed consumer shopping habits it’s also a “fantastic vehicle for communicating our brands and their product attributes in a way that was much more difficult to access previously,” Murray says. “We believe that the digital world and brick-and-mortar stores are equally important in the overall retail climate. We’re fully committed to embracing both.” —B.C. The Epic Evolution of DSW, Inc.
DSW, Inc. had a very big year in 2018. We’re talking huge doings on all fronts that saw the Columbus, OH-based company undergo a complete transformation at the parent level, evolving its business from retail-centric to a full-service wholesale model with the $375 million acquisition of Camuto Group in October. The deal, which includes a partnership with Authentic Brands Group, arms DSW with an array of brands (led by Vince Camuto, Lucky and Jessica Simpson) to be sold exclusively through its stores as well as the ability to manufacture private label for other retailers and wholesalers. Camuto Group was not the only acquisition of note for DSW in 2018. Earlier in the year, the company acquired the Shoe Company and Shoe Warehouse chains that operate smaller footprint (3,000 to 6,000 square feet), family-oriented stores. Rawlins says the additions will provide growth opportunities across North America. He likens the strategy to science class experiments where a mason jar is filled with a bunch of rocks. Those rocks represent DSW stores, and 70 percent of the U.S. population is within 20 minutes of one of those locations. “I feel we’ve got enough rocks in that jar,” he says. “The sand around those rocks is what our smaller store formats represent and that’s a tremendous opportunity for growth in the U.S.” Last but not least, DSW now owns and operates the DSW brand in Canada, which had been franchised to Canadian partners several years ago. Roger Rawlins, CEO, DSW, Inc. The proof is in the numbers. DSW’s 2018 third quarter revenues spiked 17.3 percent with comps up 7.3 percent—the best results in five years and beating Wall Street’s expectations handily. In addition, the company reported its best back-to-school season in its 49-year history. On a broader perspective, Rawlins notes that since last May DSW has invested about $400 million, and market share has grown by almost two full percentage points. It marks a far better ROI than the previous six years where $1 billion in investments generated 20 basis points while $400 million over six months generated 200 basis points. As such, Rawlins says to expect more acquisitions going forward once these two are digested. In the age of athleisure and the retail apocalypse, traditional “brown shoe” brands realize that it’s adapt or die. Guys no longer want to choose between comfort technologies and style, nor do they want to wear sneakers 24-7. Ecco continues at the forefront of meeting these demands. The Danish brand has been in a period of transition, according to Felix Zahn, product director. “We are evolving from a classic comfort brand to an innovative comfort brand, which touches pretty much every aspect of the business,” he says. Last year, Ecco launched three major product concepts that integrate design elements that Zahn expects to become pillars of its men’s collections in the seasons to come. The Vitrus dress-shoe line was released in early spring as a combination of old-school handcrafted shoemaking and cutting-edge technology, providing unrivaled comfort and style. 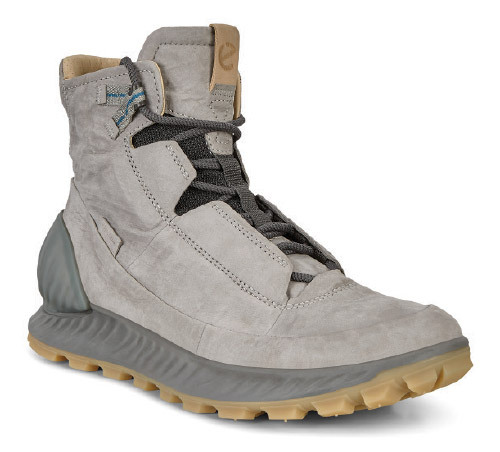 That was followed by the Exostrike, a futuristic-looking urban hiker that is part boot and part sneaker. “This product was revolutionary, not just featuring modern Scandinavian design, but also highlighting our leather and platform innovation,” Zahn says, of the latter. The Dyneema-bonded leather used in constructing the boot is lightweight but is Ecco’s strongest leather developed to date, while the Phorone midsole material is lightweight, durable and offers heightened cushioning. Ecco’s third product introduction was the ST.1 (Shock-thru technology) on athleisure-inspired silhouettes, which embeds a soft cushion core directly between the heel and the outsole. The design is the culmination of years of outsole reconstruction. “We were already known for our superb comfort features, and the introduction of the ST.1 adds almost 20 percent more shock absorption and rebound,” Zahn says. Despite concerns that Ecco’s transition to an innovative comfort brand might result in a temporary slowdown in sales volume, Zahn is pleased to report the opposite has occurred. Sales were up in 2018 both in the US and globally, outpacing many competitors. “We managed to grow in every category we do business in (men’s, women’s, outdoor and golf) in 2018,” he says. While traditionally a men’s brand in America, Ecco has also seen continued growth in women’s over the past three years. “Our strategy to evolve the brand and launch ever more innovative products to meet more consumers is working,” he says. 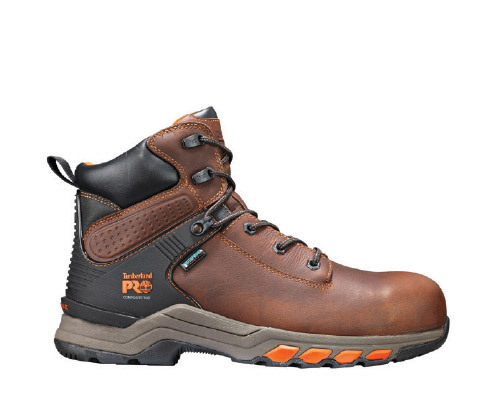 Timberland Pro extends its run of Plus Awards to its fourth straight year as it continued to push boundaries of the work boots category in 2018. “We were really proud of a partnership with SD Max where we created an innovative line of slip-resistant product, built on a Max Trax foundation for men and for women and leveraging our proprietary TPU outsole,” says Bob Sineni, vice president and general manager of the brand. While Timberland Pro doesn’t disclose specific numbers, based on presentations by parent company VF Corporation it posted double-digits gain. Footwear did the heavy lifting, since it dominates the Timberland Pro mix as a more recently introduced apparel line still establishes itself. A top performer was Hypercharge, a technology-filled boot that has StableStride, which provides lateral stability on uneven surfaces, Carbon Shield, a lightweight protective toe cap, as well as Independent Suspension Network and Pro’s anti-fatigue comfort system. Another line that successfully melded work performance demands with innovation last year was Drivetrain, says Sineni, which combines Carbon Shield and anti-fatigue design for both men and women. Last but not least, Sineni cites the Ridgework collection as noteworthy in 2018. Ridgework includes Carbon Shield and StableStride in a non-traditional design—the modern look provides a little bit of “sizzle,” says Sineni. While it’s not the goal of Timberland Pro to be a “fashion” brand—and indeed heritage styles continued to be strong performers—new aesthetics like in Ridgework help expand the work boot category beyond the marketing cliché of a laborer kneeling in the mud in his traditional six-inch tan leather boots. “We spend a lot of time in the market with the wearers and try to see what the challenges are they’re having on the job site and bring those challenges back to the innovation lab,” Sineni explains. How does Timberland Pro plan to keep its momentum going? A weak spot in 2018 was performance in Europe, where a network of distributors in each country has meant the brand hasn’t gotten the support it needs. As a result, Timberland Pro will relaunch itself in Europe after pulling distribution back in house. The brand is partnering with sister VF Corp. brand Dickies to utilize a European distribution model that will get Pro presented as a premium brand on the continent, in line with its positioning in North America, Sineni says. —B.C. the fact that Birkenstock had another banner year in 2018 is not really news, not when the legendary comfort brand has experienced seven consecutive years of unprecedented growth. What is noteworthy, however, is how its women’s business had a “breakthrough” year, according to David Kahan, CEO of Birkenstock Americas. The overriding philosophy behind Birkenstock’s master plan is maintaining focus. Specifically, not to lose sight of what has brought the brand to the dance in the first place: incredible comfort in its quality products. “Our expansion style-wise has been incredible,” Kahan says. “But we stay absolutely true to our heritage and DNA as an authentic German, handmade comfort brand.” —G.D. 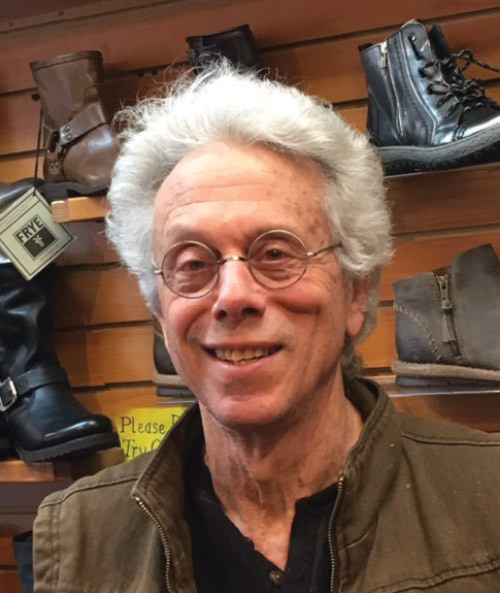 Let’s get right to the point: 2018 was a good year for Pegasus Footwear, with sales at the three Hudson Valley comfort specialty stores up 8 percent overall compared to the previous year. With flat considered the new up across much of retail, that’s impressive for the three stores located in the touristy/New Yorkers’ second home towns of Woodstock, Rhinebeck and New Paltz. 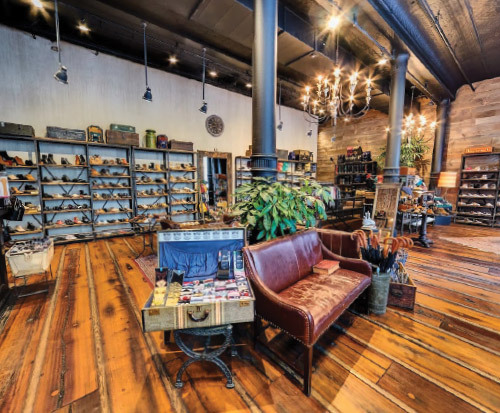 The locations surely play a key role as many look to escape the bustle of the Big Apple for “weekends in the country,” enjoying the laid-back shopping and dining found in these quaint downtown districts. Other factors contributing to Pegasus Footwear’s good fortune in 2018 include a snazzy new red van—complete with a flying horse logo (of course)—that transferred inventory between the three stores on a weekly basis. It resulted in a better balance of inventory management. That inventory, Sapiro adds, is quite extensive—another key draw for customers. “We carry over 50 brands, including most major brands as well as several new, unique and smaller brands with our emphasis always on comfort and style. We’re always searching for new brands to continually freshen our selection.” Strong relationships built over 30 years doesn’t hurt either when it comes to creating this enticing selection. “Over the years, I’ve developed strong relationships with vendors that gives us an advantage procuring hard-to-get styles as well as getting great deals on others,” Sapiro says. Sapiro has a five-point checklist for brick-and-mortar stores to have a chance at being successful today. 1. A good location. 2. A well-trained and motivated staff. 3. Attention to inventory choices. (Sapiro’s favorite aspect of the business.) 4. Excellent vendor relationships. 5. Constant attention to detail. While that list may seem obvious, it’s not so easy to excel at, especially on all points, at all times and up against unforeseen challenges and outside pressures. Sapiro says it requires an ability to stand tough while at the same time being able to adapt quickly, and to see the bigger picture without ignoring the finer points. “I often preach to my staff that the shoe business is a continual series of small details,” he says. It helps, of course, that Sapiro loves his work. “I’m so lucky to be making a living doing what I enjoy,” he says. That’s despite rising overhead costs (Pegasus Footwear’s most pressing challenge) and the struggles of Main Street against fierce online competition, catalogs and (a lesser extent) malls. He continues to fight the good fight by giving his customers the best comfort shoe stores possible. “The best way we can compete is to strive to offer a unique and memorable experience for shoppers walking through our front doors,” Sapiro says. “That is the steadfast focus of Pegasus Footwear.” —G.D. is the calling card of DNA Footwear stores. How did DNA Footwear, the seven-store Brooklyn-based boutique chain (with an outpost in Soho and the opening of its first-ever pop-up shop in Miami last fall), stand firm amid the earth-shaking retail landscape of 2018? CEO and Founder Daniel Kahalani cites myriad efforts that span retail ABCs to laying the groundwork for a wholesale launch that enabled the business to survive and, more importantly, position it to thrive going forward. Last but surely not least, Kahalani credits DNA ’s success to being a unique draw in a dwindling array of options. There are just not that many shoes stores left, he says. And of those that remain, they lack the curated assortment of strong brands merchandised in DNA Footwear’s signature rustic chic décor. (Think no tired slatwalls.) “DNA Footwear is different kind of vibe,” he says. “People know and trust us—the service, selection and value are all there. We’re destinations in our neighborhoods and a part of those communities.” And while the drive to make the customer experience special never wavers, Kahalani is extending that focus this year to his (75) employees. “I want them to make sure they’re happy,” he says. “Whether it’s monthly mediations or get-togethers, I want to work on the culture from within in order to shine on the outside.” Kahalani believes it’ll be another win-win scenario: happy employees work better and stick around longer. “It’s tough to find good employees, so I want to keep the ones we got,” he says. DNA Footwear is an inspiring entrepreneurial success story—one that began when employee No. 1 (Kahalani) subleased 12 feet of wall space in a friend’s apparel store in Brooklyn, NY, in 2004. Through all the trials and triumphs—the blood, sweat and tears—Kahalani has found a way to survive and thrive. Despite the occasional recurring fantasy about easier careers, his enduring love of shoe retailing is what keeps him in this game. “My greatest enjoyment is seeing someone walk down the street carrying one of our shopping bags,” Kahalani says. “We made that person happy, and that just puts a smile on my face.” —G.D. Ugg certainly knows how to celebrate a birthday. In its 40th year, the division of Decker Brands built on a successful 2017 with continued growth, highlighted by a 3.6 percent net sales increase to $761 million in the third quarter. In fact, Deckers President and CEO Dave Powers attributes the continued momentum of the entire organization to Ugg’s recent success. “Our third quarter results were propelled by the Ugg brand as it successfully delivered a compelling product offering with thoughtful and controlled distribution,” he says. 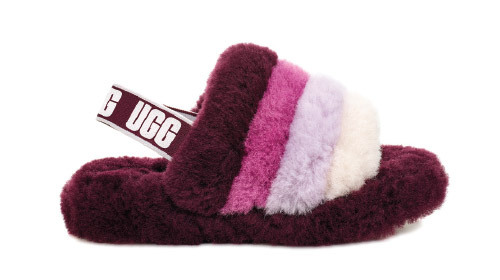 Need further proof that Ugg is on the rebound? An article in Forbes last year cited data from YouGov BrandIndex that suggested the brand is in better shape with female consumers than at any point since the tool began tracking it in 2010. Ugg’s Impression score—which asks respondents if they have an overall positive or negative impression of select brands—sat at an all-time high of 17 with women shoppers. It marked a seven-point increase from the previous June. 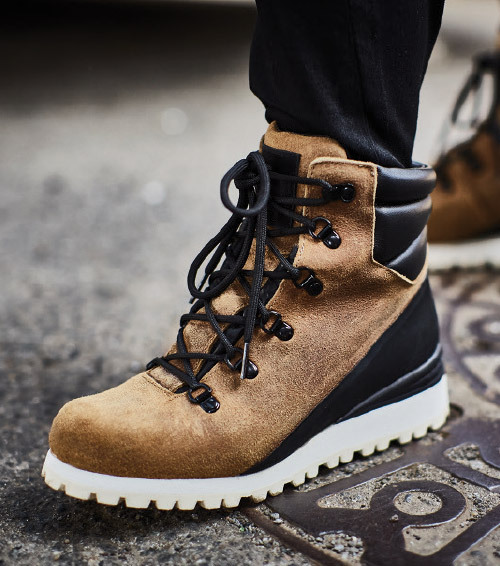 Setting a breakneck pace, Ugg started out the year with three collaborations debuting on the runways of Paris Fashion Week with Y/Project, Sacai and White Mountaineering. In April, the brand hosted an exclusive brunch at Coachella before shooting the Spring/Summer 2018 content on site. Celebrities like Winnie Harlow and Dove Cameron attended, and Rihanna even posted an Instagram of herself in the buzzworthy Ugg x Y/Project thigh-high boots before wearing them to the Beyoncé concert. While known for its boots and getting a boosts in sales thanks to early season cold weather across the country this fall, a portion of Ugg’s growth in 2018 is attributed to its expanded spring collection. 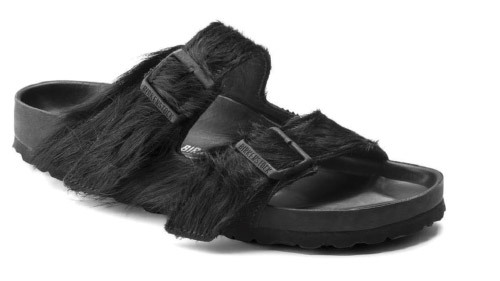 One of the brand’s most popular silhouettes last year was the Fluff Yeah Slide, which drew inspiration from Ugg’s classic boot style to create a fashion-forward sheepskin slipper/sandal. “We had a hard time keeping it on the shelves,” O’Donnell says, adding the brand will continue expanding into more traditional shoe categories toward its goal of becooming a season-less brand. “Ugg is still perceived as a winter brand, and I think that we proved otherwise due to performing so well in unpredictable and warmer weather,” she adds. To mark its 40th anniversary, Ugg launched a global campaign in October led by supermodel Adwoa Aboah, designer Heron Preston, influencer Luka Sabbat and style icon, musician and activist Lil Miquela. The campaign culminated in an exclusive event at Hollywood’s Chateau Marmont hotel attended by celebrities and influencers. Grammy-winning R&B singer H.E.R. performed and announced her role as the new Ugg brand ambassador and that she would star in Ugg’s Fall/Winter 2019 campaign. The event put a cherry atop a successful year for Ugg, according to O’Donnell. “We created a great deal of brand heat and exceeded our financial goals,” she says. “It was a great year for our wholesale, direct-to-consumer and marketing as we came together and achieved great results.” —A.J. TNF’s commitment to footwear is personified by Dijan, who was hired last year to take the helm of the footwear strategy. The France-based Dijan, who enjoys skiing the Alps on weekends, has been a consultant to various brands as well as an executive leading footwear strategy for Arc’teryx, Wilson (tennis) and Salomon. Now he’s taking what’s already a strong brand—overall TNF sales have been growing double digits for parent VF Corporation the past year—and tightening the connection between its performance roots and broader lifestyle following. It’s a connection that, Dijan says, hasn’t always been made over the years and thus a missed opportunity. The aim is to connect the brand’s emphasis on exploration with the fact TNF apparel is being embraced by tastemakers of late. Dijan wants to “broaden the reach and the conversation of the brand without alienating the roots and the DNA.” To that end, Dijan established a new Footwear Innovation Lab with the goal of bridging the gaps between TNF-sponsored athletes, product creation and merchandisers, so products can be tested at elite levels ahead of being rolled out to retailers. San Francisco Bay Area outdoor culture of the late ’60s. While retro lines have been strong for TNF, a focus continues on meeting consumer desire for more sustainability regardless of the style or end-use, he adds. In addition to expanding its direct-to-consumer sales, which currently makes up roughly one-third of sales worldwide, TNF opened “The North Face Prototype,” a model store of the future in the trendy Williamsburg neighborhood of Brooklyn. More than just a bigger and better retail experience, “it’s a way for us to learn and be much more for the end-consumer,” Dijan explains. That includes everything from product cycles and back office operations to discovering ways to better connect with audiences TNF hasn’t in the past. The brand will evaluate the store’s performance through 2019, with either the whole format or aspect of the experience being expanded to other locations in years to come. “We’re learning, defining and inventing to bring newness and excitement to the customer,” Dijan says. —B.C. It’s taken just seven years for Ronnie Fieg and his boutique Kith to become a force in the world of wider fashion, thanks to his focus on trendy sneakers and streetwear. Inspired by his youth in Queens, New York, owner and designer Fieg has made his New York based Kith a favorite from Harlem to the Hamptons by combining unique and limited-edition styles with an uncanny feel for always being of the moment. It’s a style Fieg puts a lot of effort into protecting. Brands can’t distribute images of their product in Kith stores, for instance, and many of the chain’s latest collabs are top-secret affairs. It’s all about upping the hype factor, and it’s working as Kith has expanded to seven locations—three in New York (Brooklyn, Soho and a kids’ outlet in Greenwich Village) and one each in Miami and Los Angeles. In addition, there are two shop-in-shop Kith boutiques. One resides on the top floor of New York’s Bergdorf Goodman and the other opened last year at Hirshleifers clothing store in Manhasset, NY. Despite its aura of exclusivity, Kith’s merchandise runs the gamut, from a $54 Adidas by Stella McCarthy Energy Boost to a $700 Off-White Moto Wrap. (Many of Kith exclusives are resold in the secondary market for much more.) At any given time, there is a selection of collaborations between Fieg and leading brands. Chief among them is an annual range of New Balance styles. This past year it was three versions of the 997, each with six colorways, that blew out of the stores. In January, Kith unveiled its first Vans partnership, Sk8-Hi Zip LX, an Old Skool LX, and an OG Classic Slip-on. Kith sold a joint Vans-The North Face all black MTE sneaker boot in 2018. Each Kith location is immaculately merchandised, with sneakers encased on shelves like jewels. Rather than being off-putting, the presentation acknowledges the great importance many customers put on these shoes. This isn’t just sneakers for kicking around in or going to the gym. Kith’s selection is often the centerpiece to an outfit. 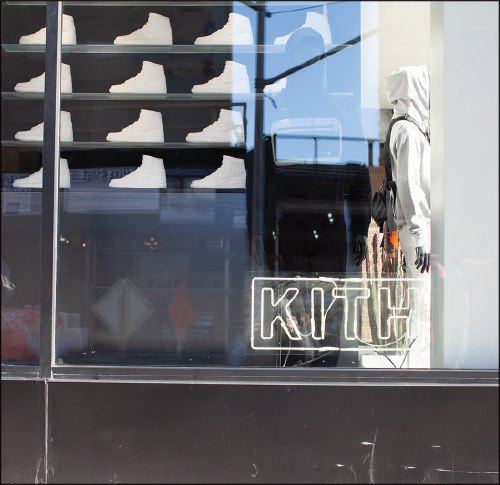 Kith is a destination store for the deepest of sneaker lovers, serving as one of the epicenters of streetwear culture. Kith is about the shopping experience as it is about the merchandise. “When we built the store, we wanted it to be more about enjoying the experience. Product comes and goes, but experience live forever,” Fieg told Esquire in 2017. A fashion designer in his own right, Fieg made his bones working retail, starting as a stock boy at David Z in New York. He worked his way up to buyer for the chain before heading out on his own. The experience, he told Esquire, has served as the basis to building Kith. “Working as a buyer makes you really understand what people want and when you should offer it to them. That’s what retail is all about—if you’re a month late or a season late or a year late, the same product won’t move.” —B.C. Part of the effort involves making sure Stride Rite is visible in all tiers. Thanks to its “Good, Better, Best” strategy, the brand is making those inroads. The premium level collection, for example, is aimed at sit-and-fit specialty retailers. The collection features all of Stride Rite’s bells and whistles, including extra widths, whole and half sizes and top quality materials. The brand also incentivized renovations in select stores to include Stride Rite Fit Zones, where a scanner measures children’s feet in four seconds and ensures the proper fit. “I was a Stride Rite store manager 30 years ago, and buying kids shoes hasn’t changed,” McManus says. “Moms want it to be easy to buy, kids want an experience and stores want to best help their customers.” Other retailer programs included new fit training to give employees the tools needed to provide the right fit. For mid-tier retailers, the brand launched its Stride Rite 360 program, designed to help turn inventory faster. Instead of carrying shoes in extra widths, Stride Rite created one last with a removable insole to accommodate wider widths. “This means retailers carry less inventory and can turn product quicker,” McManus says, adding, “Customers can see the differences between the 360 and premium line so, depending on their economic situation, they have the ability to choose.” For the mass market, the brand introduced Surprize by Stride Rite exclusively at Target, which offers shoes based on a singular, wider last, promising a great Stride Rite fit at a lower cost. As for technology breakthroughs in 2018, Stride Rite debuted the market’s first machine washable light-up sneaker as part of its Made to Play line. “The color combinations allow it to be worn with everything, so it doesn’t look like a toy on the feet,” McManus says. “And mom can put it in the washing machine, which they love.” Stride Rite also introduced machine washable glitter and metallic boot styles, allowing young kids to sport the latest trends. Even the brand’s Soft Motion collection of first walkers, traditionally all-white lace-up booties, included big bows, bright colors, fun prints and glitter. The concerted effort to have Stride Rite present in all tiers without cannibalizing each other, introducing new technologies and expanding the range of styles is paying strong dividends, according to McManus. He reports gaining distribution in retailers who hadn’t carried the brand for several years. The most notable was Nordstrom, which experienced great sell-through in the baby market and, McManus adds, may expand the assortment this year. “We’re defining our price value story in the marketplace by focusing on the premium part of the business and seeing the halo effect,” he says. “It’s all about innovation, fit and quality, which our team has done a great job doing.” —A.J. With an industry legacy stretching back more than 200 years, Clarks has hit a sweet spot by reinterpreting classics in fresh designs. It‘s authentic and new at same time. Styles like the Wallabee and Desert Boot lead the way, according to Tara McRae, global chief marketing officer. “When consumers are faced with so many choices in an oversaturated market, they always gravitate towards what they feel is authentic and progressive at the same time,” she says. One key way Clarks Originals found the balance between authenticity and progress in 2018 was through its myriad collaborations, including with such heavy hitting brands as Supreme, Kith, OVO and Disney. In celebration of Mickey’s 90th birthday, Clarks Originals launched a limited-edition Desert Boot stamped with Steamboat Willie. The brand also released the first official Wu-Wear Wallabee stamped with “Enter the Wu-Tang” as well as the iconic hip hop group‘s logo. McRae is proud of the brand’s passion to reinvent its iconic products and make them relevant today. “From collaborations ranging from Supreme and Bergdorf Goodman, to the beautiful color and material stories of our Made in Italy products, we continue to innovate and give our fans a reason to keep coming back,” she says. 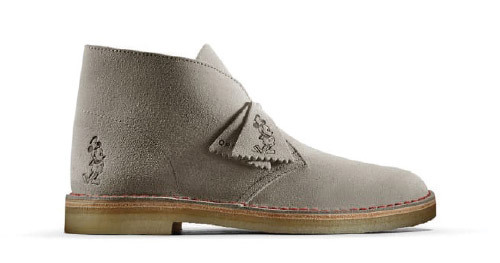 The Desert Boot continued its momentum as the top Clarks Original seller last year, closely followed by the Wallabee. “The Desert Boot has long been a staple for our brand, and we look forward to seeing the continued success and momentum for this style alongside our other icons,” McRae says. The Trigenic Collection, launched in 2014, is fast becoming a new classic. The range, a modern, sporty alternative to its roster of “brown shoe” styles, received a snug knit update in 2018 as well as a Black Panther rendition in partnership with Marvel. After a full rebranding in 2017, Clarks Originals saw strong sales last year, and 2019 looks even more promising as the brand prepares new global initiatives. “It was an exciting year for us as a brand,” McRae says. “We’re on track for 2018 and pleased with the direction of the Clarks Originals business as we head into 2019. We’re looking forward to the year ahead and introducing more great styles.” —A.J. The kate Spade brand underwent a creative refresh in 2018, showing the first collections under new creative director Nicola Glass. Keds President Gillian Meek saw it as an ideal time to refresh the collaboration, now in its sixth year. The 2018 Keds x Kate Spade New York collection features fresh material interpretation and new silhouettes. For example, the collab’s crown jewel, the Champion in glitter with ribbon laces, expanded into a bridal collection featuring styles adorned in glitter, pearls, lace and jewels. 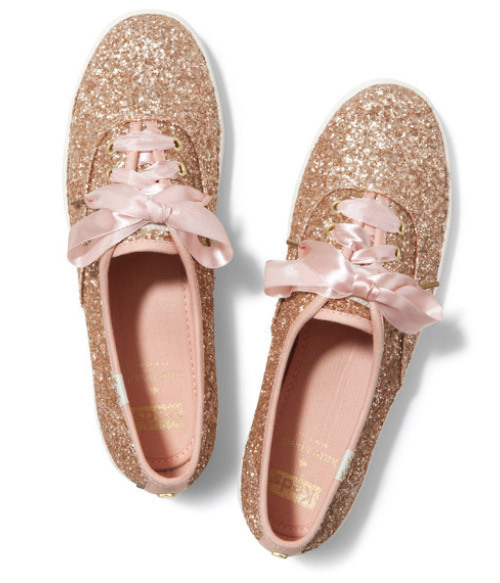 Keds learned that women have been wearing the glitter style at weddings, so the team decided to up the ante. “It has everything to do with the casualization in bridal and the multiple shoe opportunities in a bride’s day,” Meek says, adding the move made sense as Kate Spade was already in the bridal market as part of registries. The collection met with rousing success. It was immediately picked up by Kleinfeld Bridal in New York as the only sneaker silhouette on its sales floor and continues to sell well on Keds’ online platforms, she reports. The 2018 collab also pulled from Kate Spade’s ready-to-wear collections to integrate current trends—like the leopard print calf hair slip-on and the Kickstart silhouette that offered a chic but polar opposite alternative to glitter. “We were focused on getting the Kate Spade x Keds girl coming back not just for glitter but for something completely different,” Meek says. Keds also added widths to the slim Champion silhouette. “We were getting such tremendous response from consumers, and we wanted it to be accessible for everyone,” she adds. Diverse distribution from the partnership has also helped the collab gain exposure. Keds has been expanding its independent boutique base while Kate Spade’s powerful foothold in department stores like Macy’s and Dillard’s is beneficial. “They bring a tremendous network of distribution in the department store space which helps round us out,” Meek says. Meek attributes the collaboration’s success to the two brands sharing a similar spirit. “We look to partner with like-minded brands with similar points of view around female empowerment,” she says. “Keds is an accessible, American brand with fun in our DNA, and so is Kate Spade, a brand whose genesis is a businesswoman.” The iconic white canvas Champion sneaker also serves as the perfect blank canvas to interpret Kate Spade’s use of diverse prints, materials and embellishments. “Celebrity endorsements and collaborations are often short-term partnerships,” Meek says. “This has been going on for almost six years, and neither Kate Spade nor Keds sees any slowdown or reason not to continue the collaboration.” —A.J.